In a short video clip titled “Who Killed the W ooly Mammoth?” National Geographic attempts to explain the extinction and death of the Wooly Mammoth by means of a meteor impact. The video is basically a defense of how a meteor could have killed the Mammoths while not leaving any evidence (an impact crater) behind. Their solution to the missing crater? Easy. 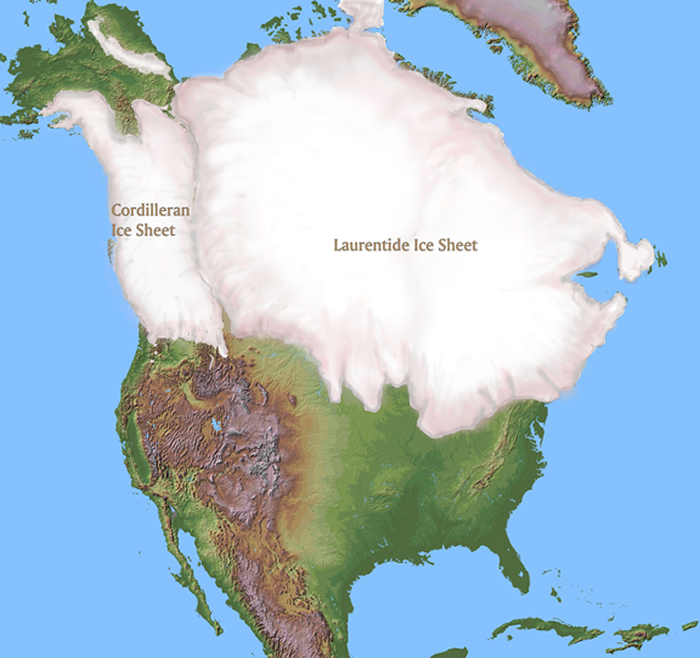 The Laurentide Ice Sheet (an ice sheet that at one time extended from the Arctic north through east Canada and down to the northern United States). The Ice Sheet, according to National Geographic, basically served as a mask that covered up any traces of a meteor hitting it and killing the Mammoths. But is this accurate? Is this an accurate representation of the evidence that we do have? The video makes one claim that says the Mammoths were probably killed off by the blast of a meteor, which hit the planet with the energy “100 times that of nuclear bombs.” This attempt to attribute the death of the Mammoths by extreme heat does not take into consideration all the evidence. For example, the Mammoths which were found ‘quick frozen’ in Siberia serve as evidence against this theory. By ‘quick frozen’ I mean, that the Mammoth was found completely frozen, with semi-undigested green subtropical plants still in its mouth and stomach. In order to freeze a Mammoth in such a way that the whole thing freezes without the inside rotting, and while keeping the food it just ate prior to its untimely death still green and undiges ted, would had to have been frozen very rapidly, and in extremely cold temperatures; -150o F at least, in an almost immediate time span. This intimates that that the source of the Mammoth’s death was not heat from a meteor, but rather, from the ice of an ice meteor. The impact crater that National Geographic is looking for is actually the Ice Sheet itself, the very thing that they claim is hiding their evidence. The amount of ice present is simply way too much for uniformitarianism to explain by way of millions of years of snow. For instance, in 1958 it was discovered in Antarctica just off the Ross Shelf, that the ice was 10,000 feet thick, the second half of that being below sea level. It might be useful for us to notice that it is extremely rare for snow to accumulate 5,000 feet below sea level, on bedrock! Not only so, but Antarctica sees only eight inches of snow per year, and even less than that the more inland one goes. It seems a little too much to believe that eight or less inches of snow per year could create a huge ice continent such as Antarctica. Thus we must ask, “Out of whose womb came the ice?” (Job 38:29a). We must also ask how the ice age relates to the flood? One theory, which is by no means original with me, takes into account some peculiarities of the Bible. In Genesis 7:11, we read, “…on that day all the fountains of the great deep burst forth and the windows of the heavens were opened.” I understand this phrase to be a reference to “the waters above the firmament” in Genesis 1:7. It is proposed that this refers to a water or vapor canopy that existed above the earth. While this theory is finding less and less adherents, I find myself still attached to it (probably for a lack of scientific knowledge). This phrase in Genesis, coupled with Job 38:29, might give us a hint as to the origins of the ice age. Job 38:29 says, “From whose womb did the ice come forth, and who has given birth to the frost of heaven?” The next verse says, “The waters become hard like stone, and the face of the deep is frozen.” Interestingly enough, the discussion then takes a turn about the constellations, and then comes back again to talk about flood waters. What is the significance of this? First, I find it very interesting that the frost is from heaven, and that the discussion takes a turn to talk about the heavens and the constellations, only to then return back to a discussion of the flood. This seems to lend itself to the possibility that the ice came from outer space, possibly an ice meteor. The ice meteor, it is proposed by Kent Hovind, broke apart as it was flying through the solar system, which accounts for the craters on the Moon and Mercury, the canyons on Mars, and also possibly the ice in the rings of Saturn. As the ice chunks were coming toward the earth it is proposed that the super-cold ice which had a temperature of around -150o to -300o F fell upon the polar regions. The reason it fell upon the polar regions is due to the earth’s magnetic field, which would have deflected the ice toward the poles. Also, since super-cold ice is highly statically charged, it would have been magnetically attracted to the poles where the poles are more magnetized. This large dump of ice upon the earth would have caused the water canopy to collapse. It would have also caused the earth to split (where we find the fault lines today) which would have caused the fountains of the deep to burst forth. The large dump of ice would have also produced an imbalance in the rotation of the earth, which accounts for why the earth is titled on it axis today at 23o. This titling of the earth is what causes the seasons on our planet, which ironically, the Bible first mentions changes in seasons after the flood, cf. Gen. 8:22. Also, since the temperature of the world at that time was most likely tropical warm the whole world over, when the ice fell to the earth, cold air collided with warm air which caused it to rain. The rain from the water canopy, the rain from the cold front and the warm atmosphere, and the water from the fountains of the deep provided all the water needed to flood the earth. And all this was made possible because of the ice that proceeded forth from the womb of God. Brown, Walt, In the Beginning, 8th edition. Phoenix: Center for Scientific Creation, 2008. Hovind, Kent, “The Hovind Theory,” Creation Science Evangelism Web site, Adobe Flash Player 10, 45:00 http://www.drdino.com/the-hovind-theory-seminar-part-6 (accessed October 20, 2010). National Geographic, “Who Killed the Wooly Mammoths?”, season 1 episode 12, released October 01, 2007, Youtube Web site, http://www.youtube.com/watch?v=1IrxFAFL-oc (accessed October 15, 2010). Oard, Michael, “The Ice Age and the Genesis Flood,” http://www.icr.org/article/ice-age-genesis-flood/ (accessed October 20, 2010). Pattern, Donald W. Pattern, “The Ice Epoch” in Henry Morris, ed. A Symposium on Creation. Grand Rapids: Baker, 1968. Vardiman, Larry, “Out of Whose Womb Came the Ice?”, http://www.icr.org/article/out-whose-womb-came-ice/ (accessed October 20, 2010). Whitcomb, John C. Whitcomb, The World That Perished. Winona Lake, Indiana: BMH Books, 1973. “Who Killed the Wooly Mammoths?” National Geographic, http://www.youtube.com/watch?v=1IrxFAFL-oc (accessed October 15, 2010). Donald W. Pattern, “The Ice Epoch” in Henry Morris, ed. A Symposium on Creation, (Grand Rapids: Baker, 1968), 129. Other animals found in the ice frozen in Siberia are Bison, Camel, Bobcat, Horse, Rhinoceros, etc. John C. Whitcomb, The World That Perished, (Winona Lake, Indiana: BMH Books, 1973), 77-80. Donald W. Pattern, “The Ice Epoch”, 124. A compelling theory, known as the Hydro-Plate Theory, suggests that most of the water from the flood came from subterranean water chambers. See Walt Brown, In the Beginning, 8th edition, (Phoenix: Center for Scientific Creation, 2008), pg. 103ff. Kent Hovind, “The Hovind Theory,” Creation Science Evangelism Web site, Adobe Flash Player 10, 45:00, http://www.drdino.com/the-hovind-theory-seminar-part-6 (accessed October 20, 2010). This is just one theory among many, one that makes the most sense to me. For further reading and different views on the Ice Age see Michael Oard, “The Ice Age and the Genesis Flood,” http://www.icr.org/article/ice-age-genesis-flood/ (accessed October 20, 2010); Larry Vardiman, “Out of Whose Womb Came the Ice?”, http://www.icr.org/article/out-whose-womb-came-ice/ (accessed October 20, 2010); Walt Brown, In the Beginning8th edition, (Phoenix: Center for Scientific Creation, 2008).